Choosing a sling for your AR15 is going to heavily be based on personal preference and what type of AR15 you have. Choosing the wrong type of sling for your given platform can result in accuracy loss, discomfort while carrying and reduced stability. Find out why the AlientTACS Transformer won our Editor’s Choice along with reviews of the other top finishers. Durability: There are 100’s of cheap Chinese made slings and accessories out there just waiting for unsuspecting buyers to make a mistake. It doesn’t take much to get into a quality single point sling for your ar15 because lets face it, its a pretty simple piece of gear. Beware though, many of the cheaper models typically have weak attachment point(s). Functionality: A single point sling is of no use to you if it has functionality issues. The most basic of models typically have one attachment point and a simple way to adjust the loop that goes around your shoulder and torso. Others are convertible two point slings that can be used as a single point, have bungee straps or quick length adjustments. All things that if not implemented correctly can cause issues. Affordability: Single point slings don’t get too crazy on price. I believe the top sling in this list was $40 at the time of posting. 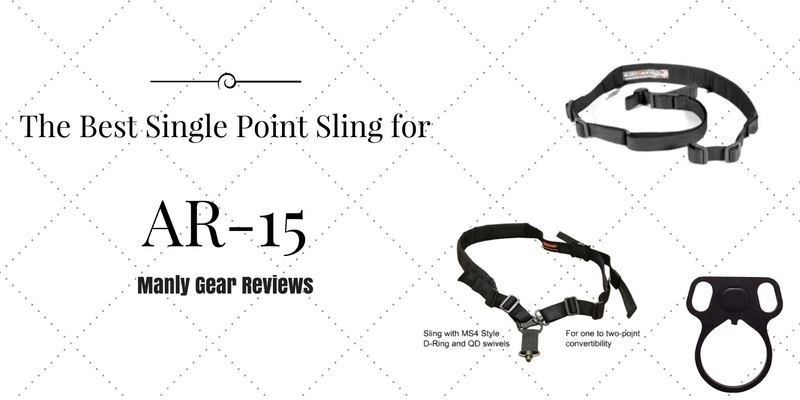 The AlienTACS Transformer Single Point Sling is one of the most versatile slings we have reviewed. While technically the AlienTACS is a 2 point sling, purchasing with the right attachment points can turn this sling into the best value around. 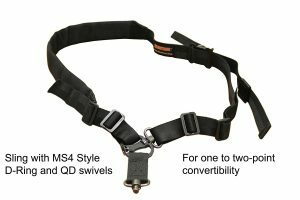 To take advantage of all it’s functionality make sure to buy the version that includes the MS4 style d ring and QD swivels. 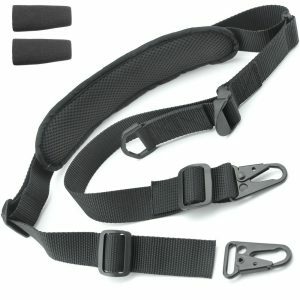 What sets this sling apart is its ability to go from a 2 point to a single point along with its ease of adjustment. Most mid to high end slings allow the user to choose the style of attachment points they wish to use. You can certainly run an HK hook style attachment on this sling and be perfectly content. The Magpul MS4 QD setup just seems to take this sling to the next level though. When considering price and functionality, the AlienTACS is clearly the best single point ar15 sling you can get for the money. Every AR15 already has to use some type of spring retainer held in by the castle nut so may as well get one with ambidextrous hook adapters on it. There are several styles of end plates with different attachment points but we found this generic one for less than 3 bucks on amazon was a no brainer. Obviously if you are wanting to use a sling with QD studs this is not the route you want to go, but if you are wanting to use HK style hooks, look no further. Your wallet will thank you. The Tactical Hero Double to Single sling is going to be one of the most affordable ways to get into a single point ar15 sling. The strap and buckles give up a bit in structural integrity to the AlienTACS and Blue Force but will hold up great for 99% of users. As you can see this single point ar15 sling comes with HK style hooks and can be used as a single point sling by either hooking the hooks onto each other or attaching both to the same mounting point on your rifle. A nicely placed D ring helps with extending and tightening the sling. Overall, if you are on a budget this is a great option with the above castle nut adapter. The Blue Force Gear sling has been a staple in the ar15 community for years. What makes the Blue Force stand out amongst it’s peers is the fact that it is made in the USA and is extremely high quality. Take note of the padded section on the sling. The padding is not thick enough to be bothersome but is dense enough to offer significant comfort when carrying in the muzzle down or muzzle up position. All Blue Force slings typically do not come with attachment points so be sure to order two of the style you prefer. If you are looking for extreme durability and made in the USA then look no further than the Blue Force Gear padded sling for your next single point ar15 sling. 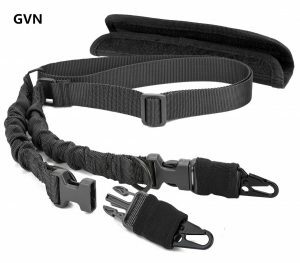 The GVN Hunting Sling is one of the few slings in this review that incorporates the use of bungees. Bungees in a sling can be useful in a sling because they can increase stability when holding for a shot. Aiming your ar15 will naturally stretch the bungee, pulling the rifle into your body. This will increase accuracy allowing for more accurate shots when in the sitting, kneeling and standing positions. Take note of the HK style hooks that come with the sling. The GVN has the ability to be used as a 2 point as well as a single. To use as a single point sling, just attach one of the HK hooks to the D loop on the other bungee. The GVN comes with a pad but its nothing to write home about. 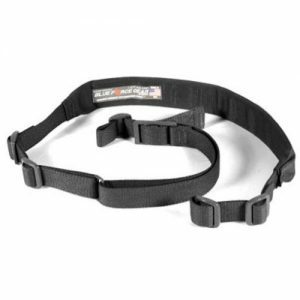 If you are wanting the benefits of a bungee in your sling the GVN is one of the best, and most affordable options. When looking for a no frills budget minded single point sling for your ar15, it’s hard to ignore the value that the AEX Single Point Bungee Sling provides. 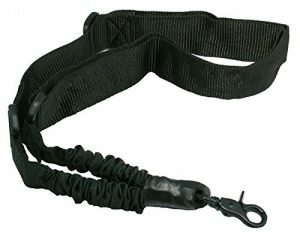 The AEX is a very basic single point sling that is meant to be used with muzzle down, front of body carry. As with other bungee slings, extending the rifle from your body allows the bungee to act as a stabilizer so your offhand shots will be more accurate. 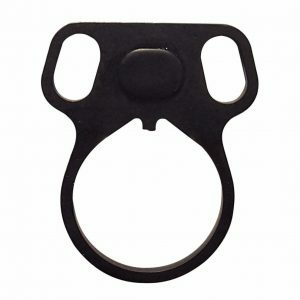 If on a budget, this sling paired with the castle nut adapter linked above would make a killer carry kit.